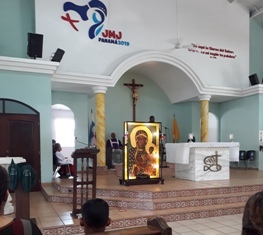 On Saturday, March 23, She left St. John Paul II Chapel in Albrook before noon She traveled to the Parish of St. John the Apostle and Evangelist, in the community of Brisas del Golf. The following day, after the Mass at 8:00 AM, the Icon went to the Chapel of the Blessed Sacrament in the Parish of St. John XXIII, to the community of December 24. She was received happily by the community and enthroned in the Sunday Eucharist. 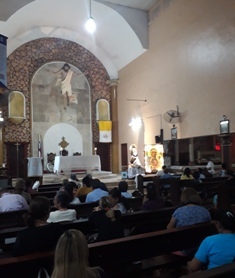 On Monday 25, the day of the Incarnation, She arrived at the Parish of Our Lady of Carmen in the community of Juan Diaz, where She had been before. The Icon arrived in the middle of the prayer of the Holy Rosary, led by the family group and the legionaries, devotees of the Virgin of Carmen. She was enthroned during the Eucharist and accompanied by the Marian groups of the parish. On Wednesday 27, Our Lady visited the students of the Catholic School Purity of Mary, where the message of the Virgin of Czestochowa was heard by children and young people of all grades. From the youngest elementary school to high school seniors, they lived and embraced the pro-life message that the Black Madonna brings. 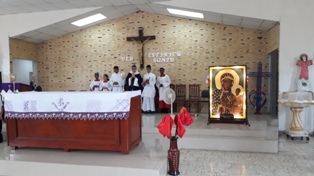 The Icon remained in the school until Saturday and then changed its parish to the Lord of the Miracles in the community of Villa Lucre. She was greeted with great joy by the Legion of Mary group together with the parish priest Fr. Jhalmar Broce. On Thursday, April 4, She will arrive at the Church of San Jose in the Casco Antiguo area, where She will be received by the Llama de Amor group and will remain until Saturday, April 6. On the day of her arrival the Icon will be accompanying the faithful in the prayer of the world rosary, organized by Mater Fatima and the Archdiocese, praying for peace in the world and for the upcoming elections in Panama.